Popcorn, Indiana’s Original Movie Theater Popcorn has a nifty-looking bag. The popcorn also tastes pretty good, I guess. When you go to the movie theatre, you expect to get gouged at the popcorn counter. 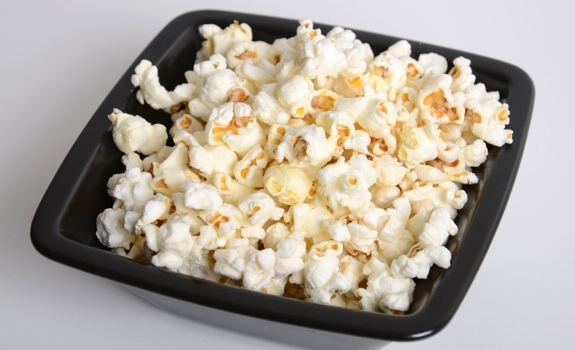 You and I both know that a $5 bag of popcorn probably costs them less than $0.50 to make. It’s not popped in truffle oil, slathered in the finest imported French butter, and sprinkled with sea salt harvested by purebred caviar-fed yaks. Suspension of disbelief is as important to the concession experience as it is to watching a summer blockbuster in the darkened theatre. So why, when you’re at home, with a case of cheap microwave popcorn several steps away in the pantry, would you choose to pay more? 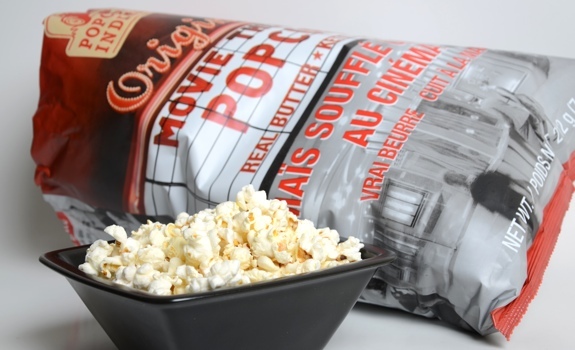 Is Popcorn, Indiana’s Original Movie Theater Popcorn so good that it deserves to be priced in the same ballpark as the movie-theatre snack? The Look: Pretty packaging that plays up the vintage cinema connection. The name/logo is written on a huge movie theatre marquee, and black and white photos of an old-school theatre, both inside and out, decorate the bag. The Taste: Not the freshest, but good. The butter taste is light and real, not overpowering and artificial. More subtle than any movie theatre popcorn I’ve ever tasted. My mouth and lips got pretty greasy/salty within a few handfuls, even though it’s not as greasy/salty as modern theatre fare. The texture is soft and oily, not dry and brittle. It tastes more like the oil-popper popcorn my parents used to make when I was a kid. So yeah, the flavour is nostalgic, but not in a movie-theatre way. The Economics: Given the price, I was expecting this popcorn to be spectacular. Turns out my expectations were a bit too high. It’s good, sure, but it’s not amazing. It sure as hell isn’t worth the price. In my experience, real movie theatre popcorn usually has more of a yellow glow to it. Cost: $5.29 for a 212 gram (7.5 oz.) bag at Sunterra Market in downtown Edmonton. Value for cash money: Beyond terrible. Availability: So far, I’ve only seen it at Sunterra. Nutrition? : Awful. Per 50 gram serving: 290 calories, 21 grams of fat, 300 mg of sodium, 4 grams of fibre and 4 grams of protein. Yikes. There are roughly 4 servings in a bag, and it’s not hard to eat half a bag by the end of a DVD. Smart Pop this sure as hell isn’t. The verdict: At what price deliciousness? It tastes good, but it’s not worth the premium. What is utterly excellent about this popcorn is that it is made from non-GMO corn. THAT to our family is very, very important. The taste is great too.